Fast Crew Supplier 3307 Security "Guardian 3"
Home › Crew Supply Vessel › Fast Crew Supplier › Fast Crew Supplier 3307 Security › Fast Crew Supplier 3307 Security "Guardian 3"
A Damen 3307 Patrol Vessel has been delivered to Homeland Integrated Offshore Services Ltd (Homeland) of Lagos, Nigeria, taking their fleet of these award-winning craft up to three in number. 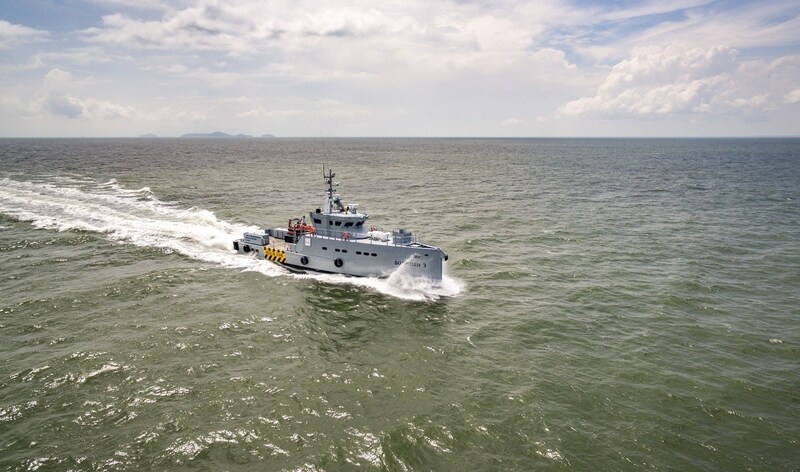 Damen’s 3307 Patrol design is exceptionally versatile and can be configured for a wide range of roles. Its axe-bow design and high-speed hull form delivers rapid acceleration and a top speed of around 30 knots, making them exceptional interceptors, each capable of providing a credible deterrent across wide areas of open sea. However with 70 m² of open aft deck they can also support offshore industries in a number of other ways, including crew transfers and equipment deliveries, quickly and safely in sea states that would leave conventional vessels struggling.